Since music is such a basic part of the human experience, being involved in creating it adds another dimension to our enjoyment of music. Learning to play an instrument allows us to put ourself into the music. The guitar, because it can be used in so many types of music, is an excellent choice when deciding to learn to play an instrument. A group class combines learning an instrument with the benefits of being in a group setting. To get an idea of what it’s like to be in a guitar class, I talked to several members of the Advanced Guitar class at Music House, and other students from different class levels. 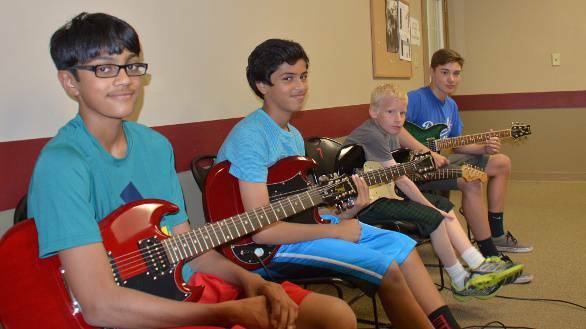 This class, for 9-12 year olds, is geared toward students who have been playing guitar for a few years and are ready to really take their playing skills up to the next level. They have already mastered the more basic skills. They have even written original songs in each level of the classes they progressed through. Now they are working on skills that will allow them to tackle more advanced songs and play like a real guitar hero. It’s more fun to learn with other students. Sharing the experience with others helps you bond and make new friends. It teaches you to play in time with others. This is a very important concept in music. Can you imagine what it would sound like if everyone in a band played at their own pace? You would probably cover your ears! Yet when students don’t have to keep time with others, they don’t notice that they slow down and speed up when they should be keeping a steady beat. You can share your interest in different types of music and check out what the other students listen to. It’s a great way to broaden the styles of music you like. Your classmate’s favorite band may become your new favorite band. It better prepares you to play in a band. Many of the Advanced Guitar class students at Music House have a goal of becoming good enough to join a band workshop. Since they are already learning to play different parts of a song together, they are gaining experience that will get them ready to accomplish their goal. The friendly competition keeps you motivated. It’s a common sight to see students hanging out before class, visiting and showing each other what they have learned: a new riff to a cool song, some awe-inspiring hammer-ons and pull-offs, a solo they wrote. Sharing these accomplishments with friends from their class makes them want to keep improving. As you can see, there are many reasons to learn to play guitar in a class setting. So if you would like to play the guitar, find a group class for the best experience.